This past week was a busy one. Editing the massive amount of video from the Adirondack chair project. There was a ton of video footage to sort through. It was a challenge to organize it in a concise way and so the ultimate decision was to break it up into multiple video segments for better presentation. I successfully got Part 1 published, only to have to take it down again due to a technical error. Thankfully, part 1 of the Cedar Adirondack Chair and Patio Set build made it back onto Youtube without too much time elapsing and part 2 was able to be published in time for the weekend. Part 3 of the Cedar Adirondack Chair and Patio Set build was posted Thursday evening and it felt good to finally finish that aspect of the project. I have always found the easy part of a woodworking project to be the actual building. It is the culmination of planning and preparation. The more planning and preparation you do, the smoother the building stage goes. You can step back from all your hard work and admire the planks of wood that used to be but are no more. You have created something. However, now is not the time to let your guard down. Now you have to decide what you want the future of this project to be. Yes cedar is very resistant to rot and mildew. That along with its abundance and relatively reasonable price is why it is one of the first species of wood used for outdoor projects. However, just because it is resistant does not mean it is impervious. 1. It turns a weathered grey color. That deep rich amber red color that makes a project look so desirable at first will soon turn to a dull grey. Which is fine if you like greenish grey. However, if why you choose cedar in the first place is the rich color. You will want to protect it. 2. Cedar tends to splinter easily. The wood grain is not a tightly compacted grain pattern like you might see with a hardwood species such as oak. Its fibers are easily split. Add to that the expansion and contraction that any species of wood will undergo, especially when left outside, and you might be picking a few splinters. 3. 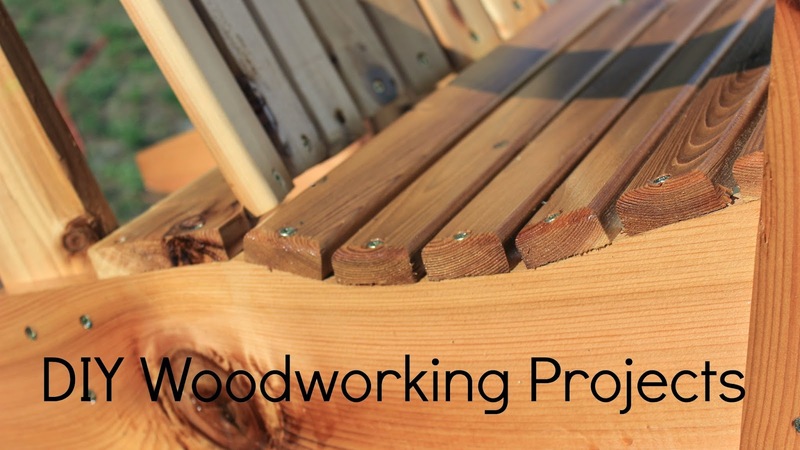 Because of the aforementioned expansion and contraction and the use of screws in a project such as an Adirondack chair; the wood around the screws will loosen over time and could potentially weaken the overall strength of the chair. This could happen despite the wood being completely rot free. I have decided on a spar urethane satin finish. Some may argue or otherwise disagree with this decision. One might say that despite the manufacturer's recommendation that it is for the protection of outdoor wood projects it just doesn't hold up. I would disagree. I recently had an opportunity to meet with and talk to a local maker of Adirondack furniture. He had a display that had been left out in the driving rain and harsh sun for going on three years. I commented to him how it looked like he had just built it. I was surprised to learn how old they were and that he hadn't done anything to them beyond the initial application. What did he use? Spar urethane. As is the case a lot of times with finishes, it is not just about the product or brand that is used. The application process is often times very critical. That is not to say that all finishing products are the same. They are not!! However, I think you'll find that you can get very good results from a lot of different techniques and products that are on the market. Spar urethane to polyurethane, brushing versus spraying. A lot of people will swear by a technique or brand based on what they feel to be most important to them. I say find out for yourself. I sprayed three coats of Spar urethane. It was a hot and sunny day with mild humidity and I was able to apply the three coats in about 6 or 7 hours. I do not sand between each coat. I know, sacrilege. One, this is an outdoor project. Two, who has forever to devote to sanding? After the second coat is dry to the touch, I run a 220 grit sandpaper across to take off any roughness and raised grain. If you go to early or to heavy with the sandpaper you are going to sand that raised grain right back into the finish. Keep in mind I sprayed the finish on. The coats are very thin. If I were brushing on the finish I would do things a little differently. However, that is a subject for another post. I hope you enjoyed this series on the Cedar Adirondack Chair and Patio Set build as much as I enjoyed presenting it. I can't wait to start my next project. Thanks for your support and as always if you have any questions, feel free. Will the real radish plant please step forward!